4 Weeks into the IWC Challenge, halfway home!! Check out the Shoulder Press in the Video Library for a review on form and common faults! The next two week intensive will focus on increasing our level of central nervous system activity, improved balance and coordination, skeletal loading and bone density enhancement, muscular stimulation and growth, connective tissue stress and strength, psychological demand and toughness, and overall systemic conditioning AKA strength training! I have done hundreds of WODs in the past six years. Starting at home with only a pull up bar, I focused on basic conditioning and some gymnastics skills. As the years progressed, I slowly purchased more equipment to feed my curiosity and allow for more variance in my programming. When I added heavy squats and presses into my program, that is when things became serious! As happy as I was with my progress at that point, years of not picking up heavy things left a big gap in my athletic abilities. These were the workouts that scared me the most. 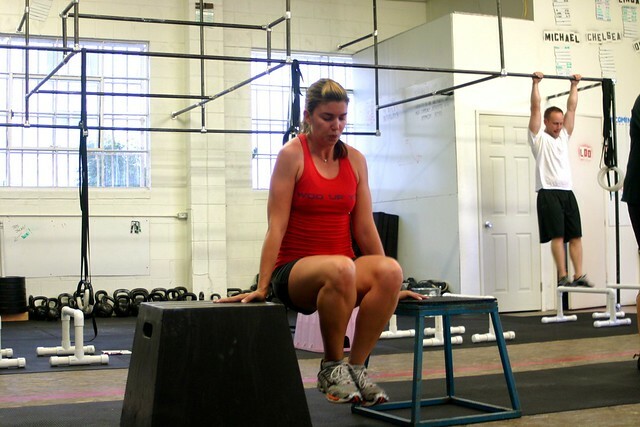 The feeling was different in a WOD that had heavy squats or overhead presses. The feeling of defeat might describe those first experiences. The progress has been slow and steady over the years, as I am still looking to close that gap! I enjoy watching the uninititated as they ponder over how heavy is too heavy. The look of satisfaction on their faces after they complete something that seemed impossible only a few months previous. I love watching the seasoned lifters get fired up like when they used to lift back in the day! Getting strong is what so many people need and don’t even know it!